Sergei Babayan and Martha Argerich in Severance Hall, Cleveland. Photo by Roger Mastroianni. Having witnessed, for several years in Europe and here in America backstage in halls, onstage as page-turner, in the practice room, and in close quarters with them away from musical pursuits, I can report that these artists are two of the most dedicated and hard-working human beings. Their personal friendship is as natural and meaningful as their musical partnership, and I have the impression that their sense of duty is foremost in the intense shaping of music in an atmosphere of sequestered privacy and mutual learning, usually during the wee hours of the night—almost without break until the sun rises the next morning. Musicians of such global presence are drawn to projects dictated in content and location by musical friendships. Cleveland owes thanks to CIPC President Pierre Van Der Westhuizen as the sole reason for Ms. Argerich’s first appearance in the city —some thirty-plus years after her only other would-be appearance here was thwarted by a car accident en-route from Montreal. Some five years ago, Sergei Babayan undertook a massive project to make arrangements of Prokofiev scores for two-piano collaborations with Martha Argerich, several of which saw premieres at the Lugano Festival. 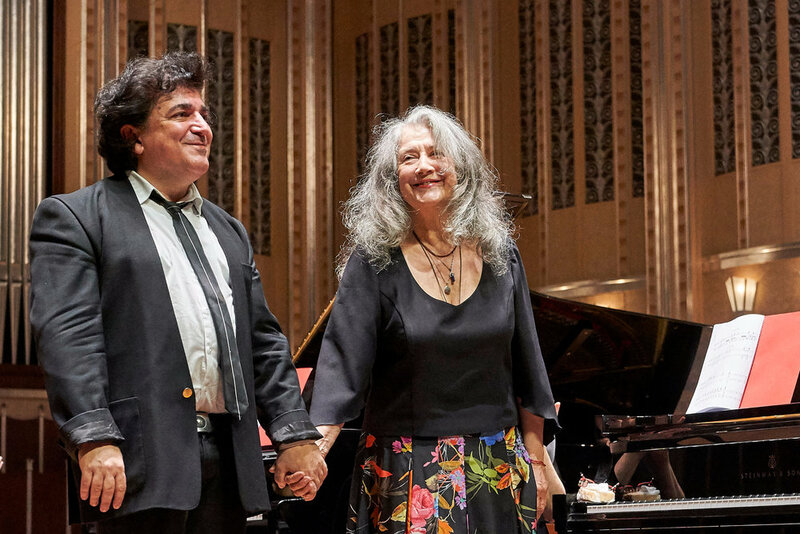 When Babayan and Martha Argerich strolled onto the stage at Severance Hall— Cleveland’s crown jewel of Georgian and Art Deco elegance— the audience projected prolonged ovations. The opening hammer blows of the Prokofiev Prologue signalled with frightening and ominous intensity the magnitude of the evening, with duelling pianos capable of apocalyptic and orchestral intensity, hypnotic trances, poetic grace, and celestial evocations of light and colour. These were delivered with electrifying rhythmic vitality, rapidly interjecting and interweaving piano parts, as well as moments of whimsical wit and grace. The classical elegance and lightness with which the performers deployed the Gavotte left audience members giggling with delight. The Young Juliet was an incredible showcase for both performers. The deliberate manner in which the Dance of the Mandolins unfolded was fantastically inevitable in its chromatic traversal of devilishly witty harmonies. For many of my musical colleagues, especially those who ponder how time changes pianistic facility, Martha Argerich fittingly represents eternal youth and Juliet’s fresh and impassioned idealism, and love for life. The truest miracles of the evening were revealed in the Mozart Sonata for Two Pianos in D Major, K. 488. This piece was shared with a range of the human experience unheard of in most performances, and the interplay of the parts was delivered with seamless transparency, and unfolded with improvised joy. Within the course of specific turns of phrase—ordinary and derivative in lesser hands—the rhetoric was confiding, as though to impart the joys and sorrows of a lifetime. The tempi in the outer movements were breathtaking. The performers were on a matched wavelength to an extent that left one to consider whether musical soulmates are determined by larger forces in the universe. A delightful aspect of witnessing Sergei and Martha’s friendship is how they make seemingly bemused remarks to each other during the applause as they walk on and off stage, noticing the hall and people. I stood to applaud after the Mozart and shouted my bravi. In a fleeting moment I cannot forget, Sergei pointed me out by name to Martha, who stopped in her tracks to smile. Concluding the evening was the U.S. Premiere of the Seven Piano Pieces transcribed by Babayan, selected from operatic, incidental and film music by Prokofiev. This cycle was a tour de force that outdid even the dynamic impact of the Romeo and Juliet cycle. “The Ghost of Hamlet’s Father” was overwhelmingly and metaphysically terrifying. The incidental music to Eugene Onegin was intoxicating in its rhetoric, and the concluding “Idée fixe” is the most obsessively ominous music that Prokofiev ever composed—and the finale was completed with an effective ending that was Sergei Babayan’s own creation. The audience reaction was near pandemonium. Trembling with excitement, I found myself hoping for the solidarity of gratitude rendered from rhythmic unison clapping that is typical of Europe and Russia, but not in America. I invited my friends sitting next to me to attempt it, and it spread to the entire hall. We had heard both Sergei and Martha at their most reactive, virtuosic, and inventive best. I brought bouquets for both performers, and kissed each on the hand. The audience was rewarded with two significant encores from the Rachmaninoff First and Second Suites. For Cleveland, this was the coup of a lifetime.